It is said that every minute of every day, Rotary will touch the lives of millions somewhere in the world. 'To enable Rotarians to advance world understanding, goodwill, and peace through the improvement of health, the support of education, and the alleviation of poverty'. In 1917, RI President Arch C. Klumph proposed that an endowment be set up 'for the purpose of doing good in the world'. In 1928, when the endowment fund had grown to more than US$5,000, it was renamed The Rotary Foundation, and it became a distinct entity within Rotary International. Two years later, the Foundation made its first grant of $500 to the International Society for Crippled Children. After Rotary's founder, Paul P. Harris, died in 1947, contributions began pouring into Rotary International, and the Paul Harris Memorial Fund was created to build the Foundation. That year, the first Foundation program, the forerunner of Rotary Foundation Ambassadorial Scholarships, was established. In 1965-66, new programs were launched: e.g. Group Study Exchange and Grants for Activities in Keeping with the Objective of The Rotary Foundation; which was later called Matching Grants . PolioPlus was announced in 1984-85. 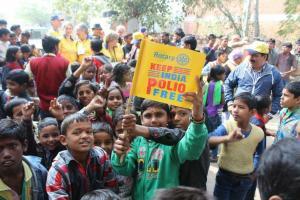 For more than 30 years, Rotary has been a leader in the global effort to eradicate polio. After years of hard work, Rotary and its partners are on the brink of eradicating this tenacious disease, but a strong, final push is needed now to finally root it out once and for all. This window of opportunity is of historic proportions remains Rotary's No.1 priority. The first Peace Forums were held in 1987-88, leading to the Foundation's peace and conflict studies programmes . Fellowship recipients prepare for a leadership role in peace and conflict resolution. Rotary Peace Fellows are leaders promoting national and international cooperation, peace, and the successful resolution of conflict throughout their lives, in their careers, and through service activities. Fellows can earn either a master's degree in international relations, public administration, sustainable development, peace studies, conflict resolution, or a related field, or a professional development certificate in peace and conflict resolution. Since the first donation of $26.50 in 1917, the Rotary Foundation has received contributions totaling more than $1.2 billion. To date, more than one million individuals have been recognized as Paul Harris Fellows (PHF) - people who have given $1,000 or have had that amount contributed in their name to the Annual Programs Fund; in RIBI a PHF, generally, is awarded for meritorious service. Rotary Grants support Rotarians in their humanitarian, vocational, and educational activities. Funding for grants depends on Rotarians and just $100 per year, £66 or £53 + gift aid i.e £1.00 per week, will enable our District to double its contribution to the annual programme fund. And it need not necessarily come from our own pockets! Rotary in the SouthWest Peninsula is making a difference in our mission to do good in the world. Can we double our efforts? The District 1175 Rotary Foundation Committee is here to provide information and support to Clubs. It administers the District funding in support of clubs' humanitarian action aiding the underprivileged worldwide. In 2015-16, the committee will continue to follow the principles of the New Grants Programme that is bringing The Rotary Foundation greater recognition. The Programme is now fully implemented and clubs are empowered to work more closely together creating and implementing greater and more sustainable projects.